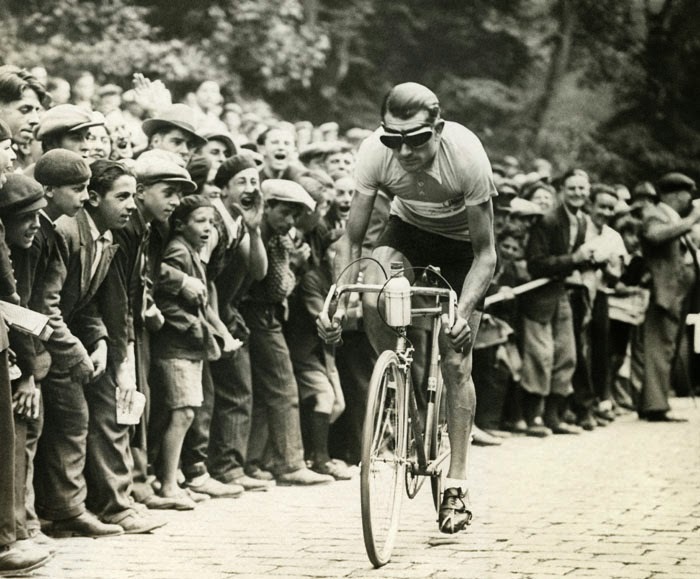 They may have been glory days, those early years when road racing was novel and one of the most popular sports in the world. But it certainly was not a lot of fun for the principal actors and one cannot but admire the cyclists in these photos, pioneers in the establishment of professional sport, as they are pictured grinding up mountains on their heavy bikes, dragging them through muddy ruts and, in that time before team cars, radios and quick bike changes, doing an awful lot of roadside repairs. The bikes were primitive and the roads to modern eyes look dreadful. The photos do not reveal much of the joy of competition but brutal hardship. 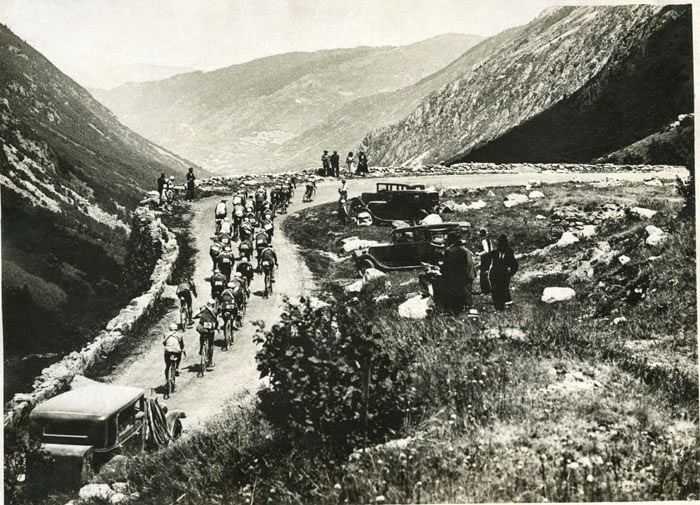 As noted in the book's introduction the 1926 Tour de France was 5,745 kms over 17 stages, compared to today's 3,400 kms or so over 21. The riders are almost always wearing heavy long-sleeved jerseys festooned with tubulars across the shoulders and everyone wears goggles (in on case two pairs!) as protection from the relentless dust of the gravel roads. The organization of everything is so simple, whether at food stops or finish lines. And one is struck by how old many of the riders, who would have only been in their 20s or early 30s, appear to us today old and exhausted. Victor Fontan, who was 36 at the 1928 Tour, looks to be 76. 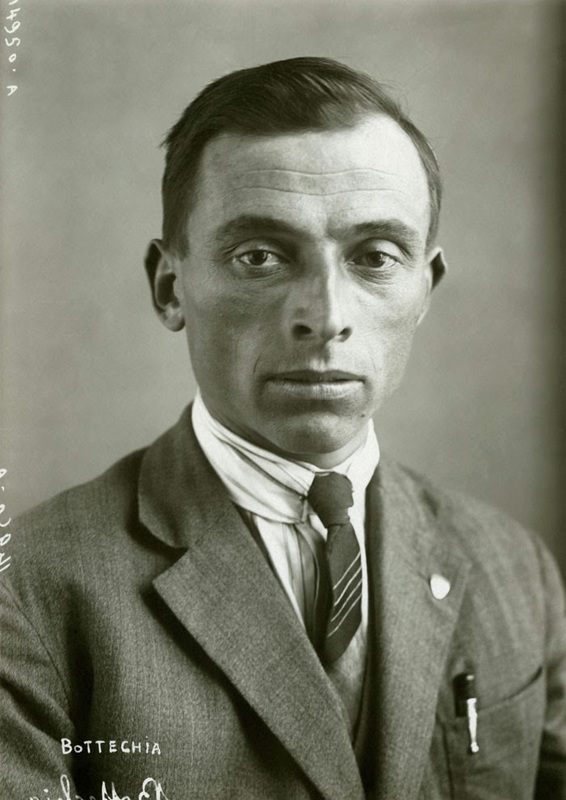 Léon Despontin, Stage 2 of the 1925 Tour de France, aged 37. Despontin, a Belgian, won the Touriste-Routier class that year but in his six appearances at the Tour managed three 7th places in the overall competition. 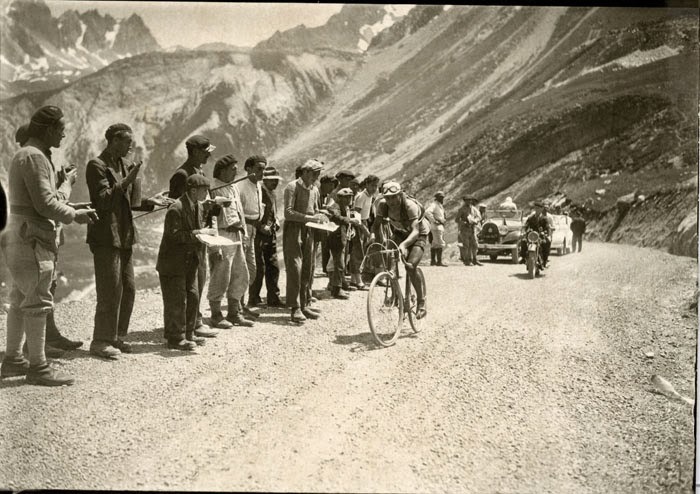 Most of the photos have not been previously published and while some are recognizable from a series, such as the one of Gino Bartali crossing the Casse Déserte on the Col d'Izoard in 1938, but others are quite new including the start line of a 1911 race for cyclists weighing at least 100 kg (220 lbs)! 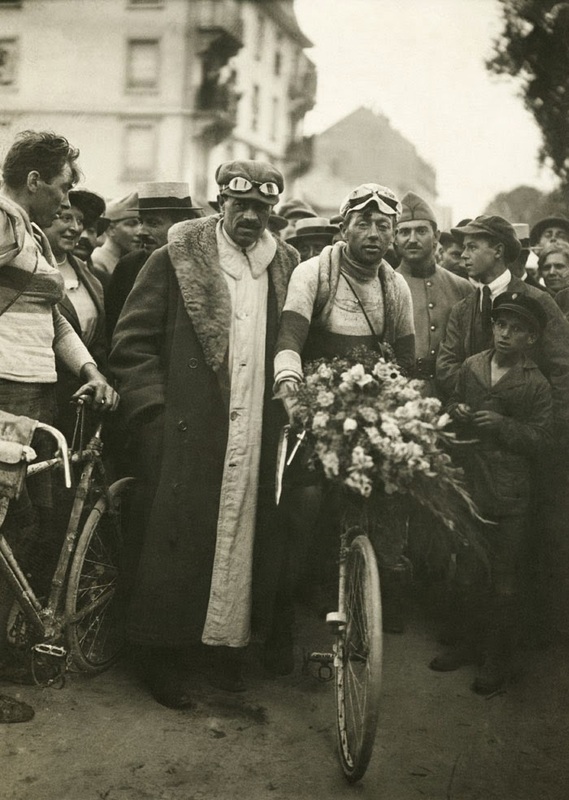 The names of those photographed include Tour de France legends Eugène Christophe, André Leducq, René Vietto, Antonin Magne and Ottavia Bottechia but others would be less familiar to today's readers. The photos are consistently interesting and nicely reproduced. “Although the photos are derived from an original negative or a print made from that negative, all of the images...have undergone some degree of restoration” writes Brett Horton in the introduction and this gives the photos a welcome freshness and makes for an attractive presentation on the whole. Each photo indicates who is in the picture, what the situation is and often a few words (very few) of description. This might be the only fault of the book as an appendix with more details of the circumstances surrounding the image would have been welcome. The photos are very much close-focussed on the riders with comparatively little attention to backgrounds or scenery and a few more photos like the Izoard one would have been welcome too. 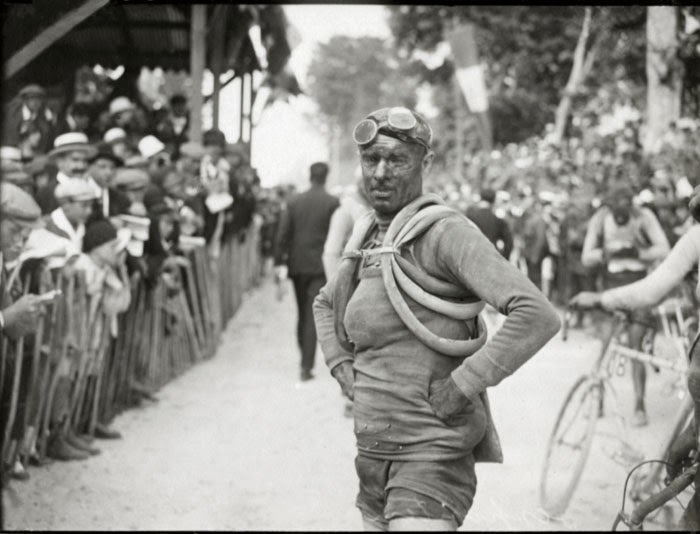 Was there any other professional sport as well-documented by photographers in this period as bicycle racing? There are excellent photos of team sports such as baseball from the period, as well as boxing and tennis and the Olympic Games (well, amateurs only there!) 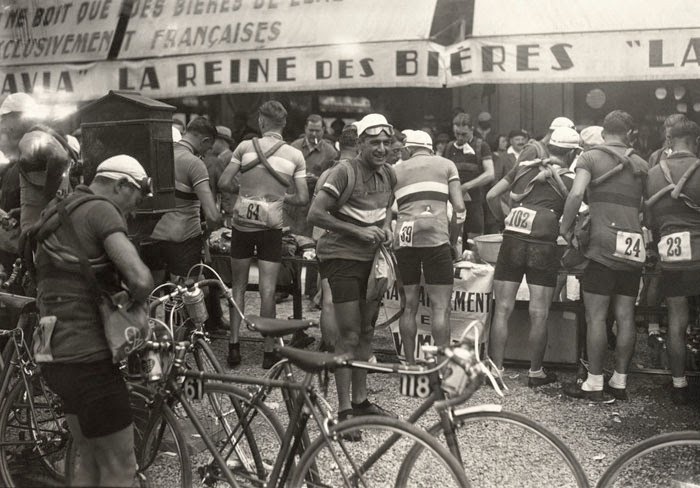 but one is struck by the feverish activity displayed in the cycling photos, a dynamism that is not always there in the visual documentation of other sports in the early 20th Century. The photos from the 1930s are in my opinion the best in capturing the action and personalities of the racers. Antonin Magne was one slick dude with perfect hair apparently. 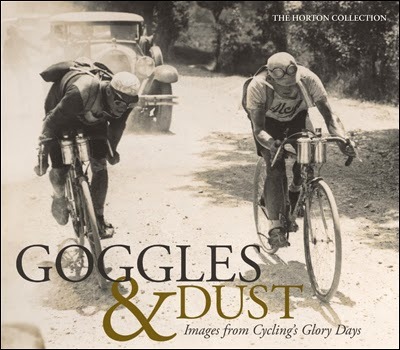 “Goggles & Dust” is a very fine collection of black and white photos covering the formative--and brutally hard--years of road racing Leafing through this small volume makes one curious as to the photos that had to be left out for reasons of space and it is to be hoped that this is only the first in a series from the depths of the Horton Collection archives. This book will be available in September 2014. VeloPress 2014, hardbound 106 pp.